The Colorado Department of Transportation celebrated the replacement an almost 80-year-old bridge about a month ahead of schedule and hundreds of thousands of dollars under budget on Wednesday, May 16. The US 6 Eagle River Bridge in Eagle (a little more than 70 miles north of Aspen) had outlived its useful lifespan, and was targeted by CDOT as in need of replacement. CDOT drew up a plan for a $2.9 million new bridge, which would consist of safety improvements, including wider lanes and an additional third lane which would better allow turns into and out of a neighboring road that intersects US 6 just north of the bridge. Construction began on July 15, 2011, with the hope of completing the project in June of the following year. CDOT and the project's contractor, CEI, worked as quickly as possible due to the uncertainty of when winter weather would roll in. When the fall came with exceptional weather, the crews decided to speed up and take advantage of their good weather fortune, even opting to work on the weekends in order to get a jump on the project in case the spring season proved difficult for construction. However, as the winter weather passed, CDOT was able to continue work at its accelerated pace. During construction, CDOT and CEI found that they could recycle some existing materials for the road base instead of buying all new materials. Due to the hard work of CDOT and CEI, and also the cost-saving recycled materials, the project opened a month ahead of its June deadline and $225,000 under budget. The new US 6 Eagle River Bridge was celebrated at a ribbon cutting ceremony on May 16. "We're thankful to the community for their support throughout the construction for the new bridges, and also to the contractor for relentless efforts made to minimize interruptions to the community during construction," said CDOT engineer Martha Miller in a statement. "Crews worked tirelessly last fall to take advantage of cooperative weather, which allowed the project to finish weeks ahead of schedule this spring, and constantly evaluated project processes in order to save a substantial amount of money." CDOT launched a new website last October that shows the progress of each of the bridges in the state rated poor, as the old US 6 Eagle River Bridge was. 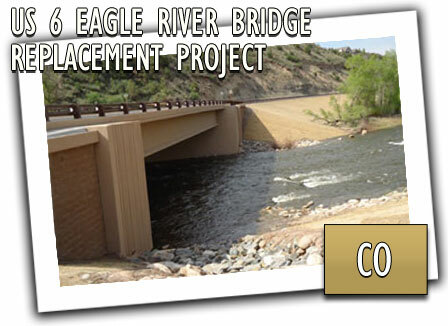 The public is able to see the status of these bridges as rehabilitation is tracked through the planning, designing, and construction phases at bit.ly/coloradobridge.